There are a dozen new apartments, all built in a modular home factory, on Grand Street in Danbury, CT that will be affordable in ways landlords and tenants don't always think about. 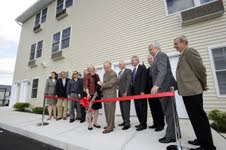 "The utility bills in these apartments will be 35 percent lower than others," said builder Paul Scalzo of Westchester Modular at their dedication. Scalzo said the new apartments have been built with high-efficiency insulation and Energy Star high-efficiency heat pumps that provide both heat and air conditioning. Mayor Mark Boughton and other dignitaries cutting the ribbon...Great PR! The Developer, John Farley, of Farley Properties, said all the utilities and fixtures in the 12 apartments are also high efficiency, so all 12 apartments get an Energy Star rating. The $1.1 million project, located on three-quarters of an acre, has six two-bedroom townhouse units and six one-bedroom units. The modules were produced by Westchester Homes in Wingdale, NY. For more information about Energy Star modular construction, contact John Colucci at Westchester Homes. Congrats to Westchester and their #1 man - John Colucci!